Electrical problems probably aren’t a common issue in your home – at least we hope they aren’t. But when an electrical issue does come up, it isn’t something that should be taken lightly. 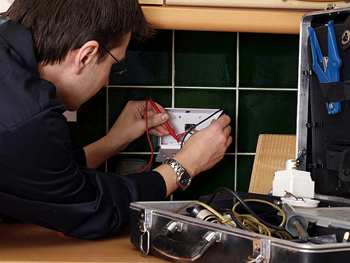 Our Dublin electricians specialize in home wiring and mechanism repair so you can be assured of a quality fix. Quality is of the utmost importance with electrical systems because even one error or oversight can lead to a potentially devastating fire. Our techs are experts at diagnosing the cause of electrical issues and have extensive experience in residential repairs. You can count on us to quickly identify and repair any existing problems and any potential future issues due to your current configurations. Our Dublin CA electricians always give you a written estimate for any project that we are called in on. We won’t start work until we have a signed estimate so you aren’t hit with surprise fees at the end of a job. This is part of professional difference. Some contractors will give you a low ball estimate and then add on several additional fees. We feel this is a very dishonest practice. With us, you’ll always know exactly what we’re doing and how much it’s going to cost you. If there is ever a need to make additional repairs, we’ll inform you right away so you can decide if you want us to proceed. Another major advantage that our Dublin electricians have over the competition is our years of experience. Electrical systems can have some very unique problems that aren’t covered in even the most thorough training courses. There is absolutely no substitute for experience, and we’ve got the most in the area. We’ve repaired hundreds of systems with thousands of unique issues from poorly insulated wiring to damage done by rodents. It doesn’t matter what caused the problem, our tech will find it and get it fixed so you can get back to your daily routine now!